Travel up to the Charter Hotel’s rooftop bar the Fog Room for outstanding cocktails and views. One of the welcome cocktail trends flowing into the modern drinking world hasn’t been about a specific drink, ingredient or style, but about a type of bar: hotel bars. For years, most (not all, but most!) hotel bars have been more about serving their important function of appeasing weary travelers rather than wowing with drinks, food or flair. However, both in Seattle and other locales, we’ve seen a turnaround with hotel bars becoming better—standing on their own as great bars. Which makes sense, because tracing back to the 18th century when the American cocktail tradition really kicked off, the hotel bar was the standard bearer and where many classic cocktails were created. At the new Fog Room (sitting on top of the also-new Charter Hotel in downtown Seattle), there’s a neat paragraph to open the bar menu that details the importance of hotel bars, and then a few suggested classic and new cocktails tracing back to particular hotels, including the Hanky Panky, a legendary drink with a delicious combo of gin, vermouth rouge and Fernet-Branca, created in 1925 at the America Bar in London’s Savoy Hotel. It’s fitting the Fog Room menu starts like this, as I believe its outstanding cocktails raise the hotel bar to perhaps its highest level yet in Seattle. The drinks menu, outside of wine, was created by Jesse Cyr (as was the separate drinks menu for the Patagōn, the restaurant on the first floor). Cyr spent four years at the legendary Rob Roy, and has been a cocktail competition finalist nationally and worldwide, so he knows his cocktail—both making classics and inventing fresh sippers. For the latter, there are nine house cocktails he’s created here. Each had by my party-of-four on our last visit was appealing, starting with the Bank Statement. 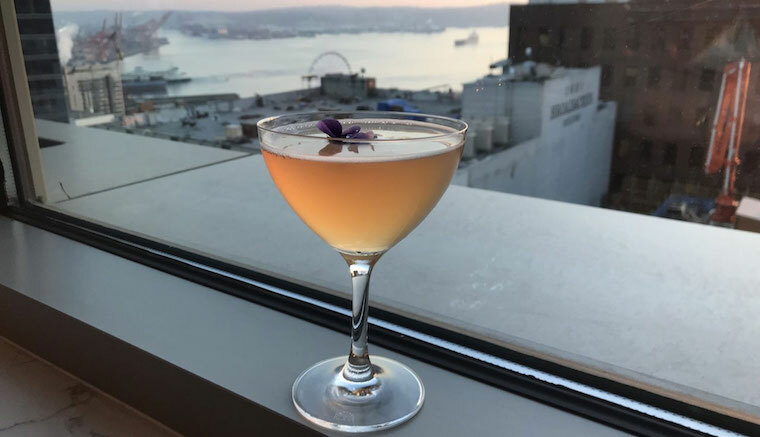 A graceful standout mingling vodka, blanc vermouth, lemon, lychee rose tea and sparkling rosé, it was, just as the description said, “light, refreshing, sophisticated,” but floral, too, and unfurling layers of flavor. The Kingslayer (Cyr is a big Game of Thrones fan) will be a boon to adventuresome whiskey lovers, combining Eagle Rare 10 bourbon, blanc vermouth, anise-y pastis, herbal-and-bitter Cio Chiaro amaro and Peychaud’s bitters. On another path, for those searching out a softer drink that still boasts body, the Whisper in the Wind with Bols genever—gin’s sort-of sturdier cousin—Lillet rose, orange, apricot and an egg white, delights thanks to the smooth lushness of that egg white. While I could wax poetic about the cocktails and view for hours, don’t skip the food. There’s a bites menu with, as you’d expect, smaller shareables, a small plates menu, and some raw bar seafood and cheeses. The Fog Room is definitely a bar first and foremost, so expect a full restaurant set up. There are enough tempting choices that you may well end up leaving full. The fries dusted with zingy Japanese spice mixture togarashi and sesame accompanied by a velvety yuzu aioli provided a perfect partner for the cocktails—we liked them enough to order a second helping. The pork belly was a hit with my meat-eating pals, grilled and with charred rapini and a gochujang sauce, and if you’re veggie-ing up, you can’t go wrong with radishes and smoked butter. When talking to Cyr, he said they’ve had a great crowd since opening just about two months ago, both hotel guests and locals taking the elevator up 16 floors. With the holidays barreling down, it’s a swell place to take visiting friends and relatives, though you shouldn’t wait around before coming yourself. If we have a rare winter sunny afternoon, those views aren’t to be missed, and if it’s raining, the cocktails will certainly make up for it.